Not to be confused with Henderson, Texas. 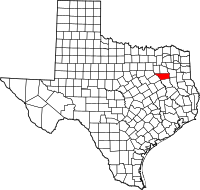 Henderson County is a county in the U.S. state of Texas. As of the 2010 census, its population was 78,532. The county seat is Athens. The county is named in honor of James Pinckney Henderson, the first Attorney General of the Republic of Texas, and Secretary of State for the republic. He later served as the first Governor of Texas. Henderson County was established in 1846, the year after Texas statehood. Its first town was Buffalo, laid out in 1847. The county boundaries were set in 1850, with some reduction from the previous size. The restructuring resulted in the need for a new county seat. In an election, Athens was chosen as the site for the "courthouse under the oaks." As of the census of 2000, there were 73,277 people, 28,804 households, and 20,969 families residing in the county. The population density was 84 people per square mile (32/km²). There were 35,935 housing units at an average density of 41 per square mile (16/km²). The racial makeup of the county was 88.50% White, 6.61% Black or African American, 0.54% Native American, 0.30% Asian, 0.03% Pacific Islander, 2.72% from other races, and 1.30% from two or more races. 6.92% of the population were Hispanic or Latino of any race. There were 28,804 households out of which 29.00% had children under the age of 18 living with them, 58.70% were married couples living together, 10.40% had a female householder with no husband present, and 27.20% were non-families. 23.70% of all households were made up of individuals and 11.80% had someone living alone who was 65 years of age or older. The average household size was 2.50 and the average family size was 2.94. In the county, the population was spread out with 24.40% under the age of 18, 7.60% from 18 to 24, 25.00% from 25 to 44, 24.80% from 45 to 64, and 18.20% who were 65 years of age or older. The median age was 40 years. For every 100 females, there were 96.20 males. For every 100 females age 18 and over, there were 91.90 males. The median income for a household in the county was $32,533, and the median income for a family was $38,255. Males had a median income of $31,847 versus $21,650 for females. The per capita income for the county was $17,772. About 11.70% of families and 15.10% of the population were below the poverty line, including 18.60% of those under age 18 and 11.80% of those age 65 or over. James C. Spencer, a former member of the Texas House of Representatives from Henderson County, 1939-1941, 1947-1949, later served as Henderson county judge from 1949 into the 1950s. He was a survivor of the Bataan Death March in the Philippine Islands. Henderson County is part of the Dallas/Fort Worth DMA. Local media outlets are: KDFW-TV, KXAS-TV, WFAA-TV, KTVT-TV, KERA-TV, KTXA-TV, KDFI-TV, KDAF-TV, and KFWD-TV. Other nearby stations that provide coverage for Henderson County come from the Tyler/Longview/Jacksonville market and they include: KLTV, KTRE-TV, KYTX-TV, KFXK-TV, KCEB-TV, and KETK-TV. Newspaper coverage of the area can be found in the Athens Daily Review, based in Athens; The Monitor is published in Mabank, which is primarily in Kaufman County, but also covers news in parts of Henderson County as well. Paul Knight of the Houston Press said in a 2009 article that some people blamed the development of the artificial Cedar Creek Lake, which opened in 1965, and development of the area surrounding the lake for the initial influx of crime and recreational drugs into the county and the East Texas region. Carroll Dyson, a retired pilot and Henderson County resident interviewed by the Houston Press, said in 2009 that the lake attracted "white flight" from metropolitan areas. Dyson added, "When all your rich people from Dallas and Houston move out here, the thieves are just drawn to them. Thieves are just wired that way. You used to not have to lock your door in Henderson County." Ray Nutt, the sheriff of Henderson County, said in the same article that when the lake first opened, there was no zoning and "a lot of elderly people bought a mobile home and moved in; it was nice. Then they passed away and family members sold them off or just let them go down." Nutt added that the area around the lake has "a lot of good people," yet it also where "a lot of criminals tend to flow." ^ A Memorial and Biographical History of Navarro, Henderson, Anderson, Limestone, Freestone and Leon Counties, Texas. Chicago: Lewis Publishing Company. 1893. p. 199. Retrieved 28 September 2014. ^ Knight, Paul. "Superthief." September 22, 2009. 1. Retrieved on September 28, 2009. ^ Knight, Paul. "Superthief." September 22, 2009. 2. Retrieved on September 28, 2009.